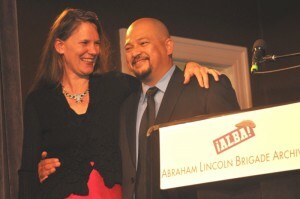 Kate Doyle and Freddy Peccerelli after accepting the 2012 ALBA/Puffin Award for Human Rights Activism in New York. Photo Len Tsou. ALBA’s annual celebrations in New York City and Berkeley, California, commemorated the 75th anniversary of the bombing of Guernica and honored the groundbreaking work of two tireless defenders of human rights in Latin America: Fredy Peccerelli, Executive Director of the Guatemalan Forensic Anthropology Foundation, and Kate Doyle, Senior Analyst of U.S. policy in Latin America at the National Security Archive. 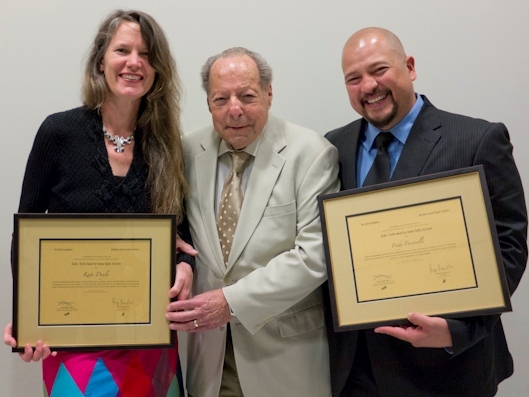 They accepted their shared $100,000 ALBA/Puffin Award for Human Rights Activism before the sold-out auditorium of the Museum of the City of New York on May 13 (video; photos). Doyle also joined the reunion festivities at Berkeley’s Freight & Salvage auditorium on May 27, where she was greeted by Lincoln vet Delmer Berg, the only surviving vet able to attend either event. He was delighted to see that the “good fight” goes on. Peccerelli heads a large team that, over the past 15 years, has exhumed hundreds of mass graves filled with victims of Guatemala’s civil war. Doyle has spent 20 years working with Latin American human rights organizations and truth commissions—in Mexico, Guatemala, El Salvador, Honduras and Peru—to obtain the declassification of U.S. government archives in support of their investigations. “The work we carry out,” Peccerelli added, “is made possible first and foremost by the thousands of brave survivors, witnesses and relatives—who have never stopped searching for their loved ones, for truth and for justice.” Peccerelli dedicated his award to the victims of military violence in Guatemala. Perry Rosenstein presenting the ALBA/Puffin Human Rights Activism Awards to Kate Doyle and Fredy Peccerelli. Photo Richard Bermack. The roundtable discussion was moderated by filmmaker Pamela Yates, whose documentary Granito: How to Nail a Dictator recounts the story of the Ríos Montt trial. Also present was Néstor Villatoro, son of Guatemalan labor leader Amancio Samuel Villatoro, who was disappeared and killed in the country’s internal conflict. Villatoro’s remains were retrieved and identified by Peccerelli’s team. Both events, which also honored recently deceased Lincoln vet Vernon Bown, closed with a stirring performance of Spanish Civil War songs by Bruce Barthol’s band. The ALBA/Puffin award has been widely covered in U.S. and Latin American media, including NPR, CNN, EFE, the New Yorker, and Salon. The New York event was made possible by the Puffin Foundation and the Rosenstein family, the Host and Honorary Committees, the Center for Constitutional Rights, the Jacob & Ruth Epstein Foundation, the Political Science Department at Pace University, and the Museum of the City of New York. I need your help in order to find more information about Daniel Hutner. As I live in Spain I cannot visit de archives of the library. I found a poem written by Daniel during an airplane attack. He was lilled in acion in September 1937, I suppose in the Aragon’ofensive.